I do believe that I have a new favorite toy in our house. 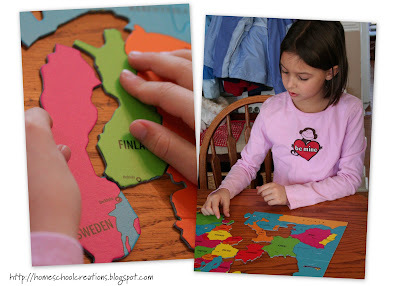 Our kids love to do puzzles and this little gem has added a touch of 'education' into the mix. And if the truth be told, I'm learning something at the same time. 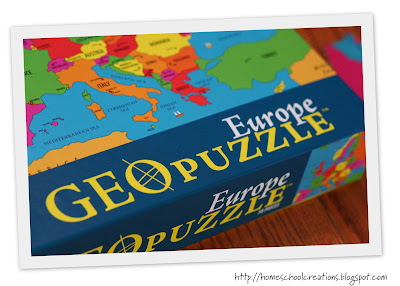 I've been eyeing this particular GeoPuzzle Europe for a few weeks and wavered back and forth on ordering it. Should I? Shouldn't I? Let me tell you, I'm about ready to plop the whole lot of them into my cart and checkout. But I'm pacing myself. 'Cause I'm disciplined like that. haha. The Geo Puzzles are so worth it! They run about $15 apiece with free shipping (I put them in my left sidebar widget for you to see). We bought the one that focuses on Europe, since that's the continent we're studying, and many of the pieces are shaped like the individual countries. The puzzle pieces also includes the names of the countries and their capitals along with any major bodies of water. The girls are having a great time with them and learning exactly how the countries all fit together. Although I haven't bought them all (yet), I do have some of the others in my cart now. Waiting patiently until we start studying those continents. If I last that long. Here ya go again, giving me something else I wanna buy! We are way to much alike!!! I'll be watching my amazon account to see if anyone buys ALL of them at once :) ha ha! You better too, cuz now I want them all, I am a geography tools junkie. Probably because I hardly remember aything from my own education and I SO want my kids to know it all in this subject! we love puzzles!!! love your blog layout too!